Last Tuesday, Apple speed bumped the Power Mac G5. Last Friday, they officially released Mac OS X 10.4 Tiger. And today, Apple introduced improved versions of the eMac and iMac G5. Both new models ship with Tiger. The 2005 eMac sees a modest performance boost. The 1.42 GHz G4 processor is just 13% faster than last year’s 1.25 GHz model. Other improvements include Radeon 9600 video with 64 MB of video memory, a step up from Radeon 9200 and 32 MB of video RAM, and dual-layer support on the SuperDrive eMac. 512 MB RAM is standard, up from 256 MB, and hard drive capacity is doubled. There is no change in price, so we’re obviously looking at increased value compared to the 2004 eMac. After visiting a few sites, I’ve found that the 1.25 GHz eMac is being closed out at US$749 with a Combo drive, $849 with a SuperDrive. That’s a paltry $50 drop at the low end, but a more impressive $150 drop at the top. Tiger will take full advantage of the improved video, and it’s not bundled with last year’s eMacs, although you can order it from Apple for a pittance with your purchase of a new Mac that comes with OS X 10.3 Panther. All thing considered – 256 MB more RAM, a bigger hard drive, improved graphics, and OS X 10.4 installed – the 1.42 GHz Combo drive eMac is easily the better value for a $50 difference in price. At the top, we have a 15% difference in price, a 13% difference in CPU speed, more RAM, more hard drive space, and the ability to burn dual-layer DVDs. Unless your budget is too tight for the new eMac’s US$999 price, it’s definitely the better buy – but the 2004 SuperDrive eMac is a good value at US$849. The speed bump on the 2005 iMac G5 is even more modest, on the order of 10-12%. In addition to a small boost in CPU speed, the 2005 iMac also adopts ATI Radeon 9600 video, but with twice as much video memory as the 2005 eMac or the 2004 iMac G5. SuperDrive iMacs now support dual-layer burning, just like the eMac, and the SuperDrive is now 8x (last year’s iMac had a 4x SuperDrive). Apple also includes gigabit ethernet, which should make the iMac more acceptable to networked graphics professionals, and Bluetooth and AirPort Extreme are now standard features as well. At the bottom, 512 MB of RAM is standard, as is a 160 GB hard drive. The new 20″ model now includes a 250 GB hard drive, and Apple trimmed $100 from its price. You can add 256 MB to the 2004 iMacs for under $30, making the $300-400 price difference on the 17″ iMacs very attractive. If that 80 GB hard drive isn’t going to be a limiting factor, the 1.6 GHz iMac G5 is a great value. One step up, the $400 savings on the 17″ 1.8 GHz 2004 model makes it a steal if you want a SuperDrive and don’t need dual-layer support or 8x speed. At just $100 more than the new 1.42 GHz eMac with SuperDrive, it’s very attractive indeed. Moving on to the 20″ model, there’s only a $200 (12%) difference in price with a 10% difference in speed. Add in the improved graphics, faster dual-layer SuperDrive, increased RAM, and bigger hard drive, and the 2005 20″ iMac G5 is the better value. In two words: A steal. 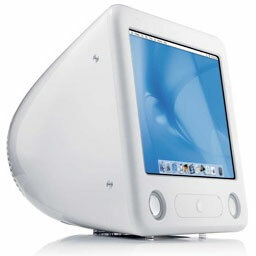 I’d skip the eMac completely and pick up a 17″ iMac G5 for the 1440 x 900 flat panel display. The improved CPU speed, better graphics, faster hard drive, and quieter computer are just icing on the cake. After all, these are refurbished by Apple and have the same one-year warranty as new-in-box product. If you’ve been dreaming of an iMac G5 – or even just wishing you could afford a 1.8 GHz single CPU Power Mac G5 and widescreen display – each one of these is a steal.